" In light of Ignatius' 'Two Standards' and 'The Mystries Done From The Garden To The House Of Annas', at any moment we can be Judas or Peter, a Christian life can be a fine line." Pedro Haber didn't actually start by saying that it was "a difficult year for the Sad Ones." He had said that it was a difficult year for the Dolorinos. The word is rooted in dolor, meaning "pain, ache; sadness, grief." When Pedro said Los Dolorinos it sounded like all of those things, a world of aching and grieving, the ones who suffer. But it had another meaning, for these were the men who, as boys, came from a happy place. Dolores was their old school, the Catholic academy, run by Jesuits. The Colegio de Dolores where they had all met had been a boarding school in eastern Cuba, once upon a time. The sadness had come later. Everyone in the room, from the busboys on up, spoke the twin languages of this nation-within-a-nation. But not everyone is equally ambidextrous, and thought and speech leapt between Cuba and the United States. At the far right of the room, near the entrance, was a special table reserved for VIPs and the guests of honor. Pedro Haber and I were sitting there, and the accents and vocabulary at this table were a mixture of proper upper-crust Castilian Spanish and plain American English. Two spots over to my right was Pedro Roig, a Dolores alumnus and Bay of Pigs veteran, who was now head of TV Martí in Washington. Immediately on my left was Lundy Aguilar, retired from his professorship at Georgetown University. , retired from all work but that of joining his fellow Jesuits in their duties of worship and contemplation. "Yes, I remember them," Dorta-Duque said, leaning forward. He meant that he remembered the students and teachers from long before the Revolution, when the future of the country was in the hallways of Dolores. "But they are all dead," he added. One of them was sitting at the same table, actually. A survivor, just a few feet away. But Lundy Aguilar didn't hear the remark, and Dorta-Duque's mistake did no harm. Two languages, two minds, a Cuban inside every American. .......The phrase Los Dolorinos harked back to a starting point, before any expulsion from any garden. of Cuba, a school of the chosen few. All Pedro Haber had meant, what he truly said, was that they, the Dolorinos, had lost yet more friends. Four had fallen from the ranks this year. For this room of Cuban exiles, locked in an actuarial competition with Fidel Castro himself, attrition was a difficult subject. ............The old Dolorinos and their wives had started arriving en masse at 7:00 P.M., most of them not just on time for the cocktail hour, but early. Over the next hour heavy American cars kept rolling into the lot, and then the same progression of aged legs crossed the street. The grass lawn of the country club would hiss as someone explored the possibility of taking a shortcut. A dress shoe came back out of the grass with a sucking sound, and a high heel stabbed an indentation in the lawn that began to fill with runnels of silt. The click of heels on brick soon followed. These men and women, averaging somewhere in their early sixties, cut no corners. Moving slowly, often supporting each other, they made right-angle turns on the brick walkways, which were uneven and slicked with algae. The men, in a mixture of brown and black suits, or sometimes the long-sleeved guayaberas, were jovial, even the one who arrived using a walker. The women had formality and reserve. (It wasn't their reunion; Dolores was a boys school.) Or maybe the women had, in their upright carriage, just the composure required by cream gowns and structured black cocktail dresses, by shoulder wraps of the very gauziest pastels. Their hair was stiff. Usually short, a tropical reality, but fixed in uplifted constructions. Their lips and eyelashes were lacquered with precision. Even on the men, every hair was in place — brushed back, Brylcreemed, ordered and clipped. You had to draw the line somewhere and this was it: neatness of tonsure was a way of fighting back, of defending civilization against its enemies. The banquet hall of the Miami Springs Country Club is called the Legends Room, but it isn't very big. There were 105 people in there by 8:00 P.M., and most of them were talking, a raucous atmosphere of jokes, bragging, disbelief, laughter, shouts, argument, and monologue, all of it bouncing off long tables of rented glass and dull knives. The crowd was prone to thick glasses and hearing aids, but functional, still able to dance and to argue. The men touched one another constantly, putting a hand on another's arm, pressing a shoulder in their grip, even clutching one another's lapels in a kind of menacing embrace. They wore pins in those lapels, showing off their allegience to political movements, their qualifications as survivors of various disasters, their enlistment in Masonic Lodges, the Elks, Lions, Odd Fellows, and Rotary, or ethnic allegiances, sporting clubs, religious leagues, cultural groups, charitable drives, and other bulwarks against the loss of everything. Ariel Dorfman, a Chilean, said that an exile had only two possessions, the language of his birthplace and the keys to a house that no longer exists. Cubans are joiners, filling their empty pockets with new things. On the way into the Legends Room, the door charge was $5, collected as a donation to the welfare fund for impoverished alumni of the school. For that money, you received a printed program for the reunion event. It listed the speakers, and featured page after page of pictures, old shots of the Colegio de Dolores in Santiago. There were many of the students of past days, and shots of the signature buildings of Santiago and the surrounding region. .............That was Cuba, but that isn't Cuba. Oriente doesn't exist anymore. Fidel Castro had literally redrawn the map, turning the traditional six into a new fourteen. The old provinces and identifications were blown up and replaced with rational borders and, sometimes, names commemorating Castro's own life. Part of old Oriente was broken off and renamed Granma province, because Castro had run his boat Granma aground there. How could an exile say he was from such a place? The old Isle of Pines, where a young Castro had served jail time, had been split off to make a province called the Isle of Youth, contractually dedicated to education. Who could acknowledge such things? They didn't sell accurate road maps, either. Never mind if Castro had built a new highway down the middle of Cuba, or that a better map would reveal all the satellite housing cities and rural polytechnic universities that had sprung up across Cuba. Nobody was going to that Cuba. The less accurate the map the better. I browsed through some copies of old photographs of Santiago, with men in straw hats, and views of the bay, or the old Bacardi rum factory. Next down the table was a Havana telephone guide from 1959. This old phone book, full of period illustrations and corporate optimism, is the single best selling item at the Cuba Nostalgia Fair, a memorabilia mart that draws thirty thousand people to a convention center in Miami once a year. Castro was raised a Roman Catholic as a child but does not practice as one. In Oliver Stone's documentary Comandante, Castro states "I have never been a believer", and has total conviction that there is only one life. Pope John XXIII excommunicated Castro in 1962 on the basis of a 1949 decree by Pope Pius XII forbidding Catholics from supporting communist governments. The excommunication was aimed at undermining support for Castro among Catholics. Fidel Castro last week lashed out at the leaders of the Roman Catholic Church in Cuba as "scribes and Pharisees," "peons of the American embassy" and "Franco Fascists." Castro's rage was aroused by a pastoral letter* condemning "the growing advance of Communism in our country." He shouted that whoever "condemns the revolution betrays Christ" and is "capable of crucifying Christ again." The Catholic Church in Cuba has only 720 priests, one for each 8,000 Catholics, compared with the U.S. ratio of one for every 760 Catholics. Moreover, Cuba's lower classes consider the church somewhat foreign; 400 of the priests are Spanish-born (most of them anti-Franco, despite Castro's accusation), and another 100 are foreigners from other countries. Although nearly 85% of Cuba's 6,700,000 population is nominally Catholic, regular church attendance is confined mostly to women and children. Castro himself went to Jesuit-run schools for eleven years and wore a religious medal as a guerrilla in the hills. But he is divorced (though not remarried) and does not go to church. His ten-year-old son, under his mother's influence, has become a Methodist. Yet even Maximum Leader Castro cannot afford to ignore the church. In the past five years, it has been a rallying point for enemies of dictators who fell in Argentina, Venezuela and Colombia. Last week, after pro-Communist gangs attacked crowds leaving Havana Cathedral, Archbishop Diaz threatened that the Cuban Catholic Church might declare itself officially "in silence"—as it is behind the Iron Curtain. As the Castro-Catholic battle got hotter, church attendance showed a sharp and significant upturn. Fidel Castro's regime is guilty of numerous documentable crimes stretching from the jungles of Peru to the deserts of Ethiopia. Documented reports exist of Cuban troops in cahoots with the Ethiopian government denying food to starving Ethiopians because of their political ideology. In Latin America, Castro funded guerrilla groups throughout the hemisphere generating terror and fear for decades. At home Castro's regime has created the most repressive police state apparatus in the Western Hemisphere. Cuba is an Orwellian nightmare set in the tropics with Big Brother sporting a beard and cigar. Cuba has refused to ratify any major international law enshrining fundamental human rights. It has refused to sign the International Covenant on Civil and Political Rights. Castro formed Committees for the Defense of the Revolution(CDR) which operate on almost every block in Cuba. Spying on neighbors and reporting back to the regime. Negative reports can land one in jail. Talking to foreigners invites questioning into your loyalty to the regime. Large numbers of individuals are incarcerated in Castro's prisons for political crimes ranging from speaking against the regime to trying to leave the island. In June 1991 at a meeting between Fidel Castro and several members of various communist organizations, it was agreed to set up the infamous Rapid Response Brigades. Their principle aim is to "defend the country, the Revolution and Socialism in all circumstances, by confronting and liquidating any sign of counter-revolution or crime." Trying to leave Cuba without government sanction is a criminal offense punishable by prison. Due to this Cubans are unable to build larger more seaworthy crafts, and resort to innertubes, and in some cases fiberglass cannisters in search of freedom. The Castro regime's response to the AIDS crisis has been mandatory nation-wide testing with forced incarceration for anyone who tested positive for the HIV virus. In addition, Castro has had a long tradition of imprisoning homosexuals and transexuals as "undesirables." Imprisonment is often based on mere suspicion and rumor. Recently it was reported that young people in Cuba are purposely "shooting up" with HIV infected blood so that they can go to these camps to avoid forced labor. In a letter dated 14 September 1992 that was smuggled out of the same prison by a group of political prisoners, it was reported that a number of prisoners with AIDS rioted on 19 August demanding better food and medical attention. Guards used rubber batons, wooden sticks, and other blunt instruments and an unknown number of prisoners were injured. Several of the AIDS sufferers were transferred to the maximum security area of the prison. Two months earlier a prisoner with AIDS sent to this area had his food quota cut in half and the diet reccomended by doctors withdrawn. The prisoner died three weeks later. The fate of the others is unknown. Castro's achievements bear mentioning and we shall list them here. First, his regime has had the longest serving political prisoner in world history: over 28 years. Cuba, in 1959 was economically self sufficient, and did not have the tourist-Apartheid of today. Tourist-Apartheid is the situation in which Cuban citizens don't have equal access to certain beaches or restaurants that Tourists do. Reminiscent of the system of segregation of the South, or of Apartheid in South Africa these conditions have been labeled "tourist apartheid." In forty years Fidel Castro took an island with pre-existing progressive healthcare and drove it into the ground. In 1959 Cuba had 337 hospitals in 1989 the number had decreased to 264. Increases in other areas of Cuban healthcare did not manifest themselves on a per capita basis. Disease in Cuba has steadily increased since 1959. Suicides in Cuba more than doubled from a 1,011 figure for 1970 to 2,220 in 1989. IT is a spiritual force. In the critical moments of Russian history it played an important role. When the Great Russian War began after the treacherous Nazi attack, Stalin turned to it in support of the workers and peasants that the October Revolution made owners of the factories and the land. When the USSR disintegrated, imperialism did not have an ally in that Church. For that reason, when His Eminence Vladimir Mijailovich Gundiav, Metropolitan Kirill of Smolensk and Kaliningrad, visited our country in 2004, I proposed to him to build a cathedral of the Russian Orthodox Church as a monument to Cuban-Russian friendship. City Historian Eusebio Leal assumed responsibility for the completion of the task. Soil from the place where the remains of Soviet soldiers who died in our country during many years of lending their services here. For that reason, when the Cathedral was inaugurated last Sunday, I felt a desire to talk with the esteemed figure from the Russian Orthodox Church who was visiting us. Tomorrow, Thursday, he will be in Venezuela conversing with President Chávez. Both are inspired by the same ethical principles emanating from Christ’s preaching according to the Evangelists, a religious belief that the two share. Then he is to visit Ecuador to talk with Correa, a political leader educated in Liberation Theology. His Eminence is not an enemy of socialism, nor does he condemn to eternal fire those of us who based ourselves on Marxism-Leninism to fight for a just world. When he talks in the UN Human Rights Council or other institutions, he is listened to with much respect. In his immense country, he talks regularly on television, for 15 minutes every Saturday, and is followed with interest by tens of millions of people. Our capital is enriched with a temple worthy of the prestigious Russian Orthodox Church, which is unimpeachable evidence of the respect of our Revolution for one of the fundamental principles of human rights, in consonance with a profound and radical socialist revolution. There is no reason whatsoever to make the slightest concession to Yankee imperialism. I have the impression that His Eminence thinks that way. He is not anti-Muslim, he respects that religion. Within his ecumenical conception, he believes that the Catholic Church can solve his problems with countries such as China and Vietnam. It was most agreeable and edifying talking with him. "You Are God, Not Us!" Daily Reflection with Father James Kubicki , S.J. Fr. Allan Figueroa Deck, S.J. A Jesuit in Disuise: Fr. John Gerard, S.J. A Visit to Goa, By Fr. John Hungerford Pollen, S.J. Blessed Bernadine Realino, S.J., By Fr. J. Moore, S.J. Conversons of Brahmins, By Fr. L. Lacombe, S.J. FATHER JOHN BAPST, S.J., AND THE "ELLSWORTH OUTRAGE." By Fr. Gerald C. Treacy, SJ. Handbook of Greek Composition, By Fr. Henry Browne, S.J. Jamaica Sketches, By Fr. P. F. X. Mulry, SJ. La Cour Saincte, Ou Institution Chrestienne des Grands: Avec Les Exemples de ... By Fr. Nicolas Caussin, S.J. Letter from Palamcottah, By Fr. P.J. Brun, SJ. Madagascar: The Jesuit At Work. By Fr. John G. Gretton, S.J. Scottish Catholics Under Mary Stuart and James the Sixth, By Fr. William Forbes-Leith, S.J. Talks on Ethics, By Fr. P. A. Halpin, S.J. The Archpriest Controversy, By Fr. John G. Gretton, S.J. The Blessed Virgin in the History of Christianity , By Fr. John A. Hardon, S.J. The Decay of Faith, By Fr. M. Gavin, S.J. The Devotion of the "Three Hours", By Fr. Herbert Thurston, S.J. The Fact Divine, By Fr. Joseph Broeckaert, S.J. The Four Fiats, By Fr. Matthew Russell, S.J. The Ideal of One World-Wide Christian Church By Fr. Leslie J. Walker, S.J. The Inspiration of Holy Scripture, By Cuthbert Lattey, S.J. The Jesuit Myth, By Fr. John G. Gretton, S.J. The League And Temperance, By Rev. Henry Van Rensselaer, S.J. The Life of William Weston, S.J., by Fr. John Morris, S.J. The Litany of St. Joseph, By Fr. Aloysius Brucker, S.J. The Rise of the Papal States up to Charlemagne's Coronation, by Fr. Joseph M. Woods, S.J. Tis Sixty Years Since, By Fr. John G. Gretton, S.J. We Should Have Missions For Children, Fr. Cornelius Shyne, S.J. A Defense of the Catholic Faith, Fr. Devivier, S.J. A Dictionary of the Kalispel Or Flat-head Indian Language By Fr. Joseph Giorda, S.J. A Foure-Fould Meditation, of the Foure Last Things, by St. Robert Southwell, S.J. A Jesuit Cardinal : St. Robert Bellarmine, S.J. A Man After God's Own Heart: Life of Father Paul Ginhac, S. J. By Fr. Arthur Calvet, S.J. A Manual of Moral Theology for English-speaking Countries By Fr. Thomas Slater, S.J. A Memoir Of William A. Stanton, S.J. By William T. Kane, S.J. A Study of Francis Thompson's Hound of Heaven By Fr. John Francis Xavier O'Conor, S.J. Abridged Course of Religious Instruction: Apologetic, Dogmatic and Moral, Fr. Francis Xavier Schouppe, S.J. Adjumentum Memoriae Manuale, Seu Tabulae Succinctae Historico-Chronologico, By Fr. Maxamilian Hell, S.J. An Easy Method Of Meditation By Fr. Francis Xavier Schouppe, S.J. Aquinas Ethicus by Fr. Joseph Rickaby, S.J. Cincinnati, the Queen City, 1788-1912 By Charles Frederic Goss, S.J. Codex Melphictensis Rescriptus By Fr. Alberto Vaccari, S.J. Compendium Theologiae Moralis By Fr. Jean Pierre Gury, S.J. Concerning Jesuits, by Fr. John Gerard, S.J. Conferences on the Spiritual Life, by Pere de Ravignan, S.J. Conversations on the Elements of Metaphysics, by Fr. Claude Buffier, S.J. De eloquentia sacra et humana, Libri XVI By Fr. Nicolas Caussin, S.J. De Matrimonio Et Potestate Ipsum Dirimendi, By Pere Jean-Pierre Martin, S.J. Della vita del P. Sertorio Caputo della Compagnia di Giesu By Fr. Antonio Barone, S.J. Devotion to Saint Joseph, by Fr.Giuseppe Antonio Patrignani, S.J. DEVOUT MEDITATIONS FOB THE HOLY SEASON OF LENT. AND DEVOUT MEDITATIONS For Every Day During The Holy Season Of Lent. With Gospels" For The Sundays, Etc. BY A MEMBER OF THE SOCIETY OF JESUS. Disputationum Roberti Bellarmini By St. Roberto Francesco Romolo Bellarmino, S.J. Elementa Arithmeticae Numericae, By Fr. Maximilian Hell, S.J. Elements of Religious Life, by Fr. William Humphrey, S.J. Fr Andrew White S.J. and the Indians, by Fr. Richard H. Tierney, S.J. Fr. Bernard Vaughan, S.J. By Fr. Cyril Charlie Martindale, S.J. Fra Girolamo Savonarola, By Fr. Herbert Lucas S.J. God Our Father, by Fr. Florentin J. Boudreaux, S.J. Guide to the Promotion of Frequent and Daily Communion in Educational Establishments, By Fr. F. M. de Zulueta, S.J. Hard Sayings By Fr. George Tyrrell, S.J. Herald of Christ: LOUIS BOURDALOUE, S.J. King Of Preachers And Preacher Of Kings Portrait BY JOHN C. REVILLE, S.J. Herbarz Polski, By Fr. Kaspra Niesieckiego S.J. Histoire de l'Eglise Gallicane, dédiée à nosseigneurs du Clergé By Fr. Jacques Longueval, S.J. History and General Description of New France, By the Rev. Pierre Francois. de Charlevoix, S.J. History of the Fall of the Jesuits Eighteenth Century, By Count Alexis de Saint-Priest, Peer of France. History of the Prima Primaria Sodality of the Annunciation and Sts. Peter and Paul by Fr. Elder Mullan, S.J. Holy Confidence, by Fr. Rogacci, S.J. Holy Pictures of the Mysticall Figures of the Most Holy Sacrifice and Holy Eucharist (1619). By Fr. Louis Richoeme S.J. Intimate Union of the Soul with Jesus in His Agony in the Garden, preface by Fr. A. Weld, S.J. Jesuits in Conflict, by Fr. Henry Foley, S.J. Jesus Living In The Priest, By Fr. P. Millet, S.J. La Journée Chrestienne By Fr. Nicolas Caussin, S.J. Lent And Holy Week Chapters on Catholic Observance and Ritual By Fr. Herbert Thurston, SJ. Life of Blessed Rudolf Acquaviva, S.J. and of his Four Companions in Martyrdom, of the Society of Jesus, by Fr. Francis Goldie, S.J. Life of St. Aloysius Gonzaga, of the Society of Jesus By Fr. John Francis Xavier O'Conor, S.J. Manual For Interior Souls : A Collection Of Unpublished Writings, By John Nicholas Grou, S.J. Meditations for the Use of the Secular Clergy By Fr. Pierre Chaignon, S.J. Meditations on the Sacred Heart of Jesus Christ, By Fr. C. Borgo, S. J.
Memoir of Father James Harris, S.J. By Fr. Thomas Norton Harper, S.J. Memoirs of Father P. Gallwey, S.J. Moniteur bibliographique de la Compagnie de Jésus, By Fr. Carlos Sommervogel, S.J. Month of the Sacred Heart of Jesus, By the Fr. George Tickell, S.J. Month of the Sacred heart, 3 novenas and a triduum. By Fr. Alexis Lefebvre, S.J. Monument Erected to the Memory of Father Ennemond Masse, S. J. Canada's First Missionary. Moral Principles and Medical Practice: The Basis of Medical Jurisprudence By Fr. Charles Coppens S.J. On the Apostolical and Infallible Authority of the Pope By Fr. Francis Xavier Weninger, S.J. Originelle, Kurz-Gefasste, Praktische Fest-Predigten Zu Ehren Der...., By Fr. Francis Xavier Weninger, S.J. Political and Moral Essays by Fr. Joseph Rickaby, S.J. Practical Meditations for Every Day in the Year of theLife of our Lord Jesus Christ. Chiefly for the Use of Religious. by a Father of the Society of Jesus. Praelectiones theologicae quas in Collegio Romano S.J. haebat Joannes Perrone By Giovanni Perrone, S.J. Protestantismus und Unglaube By Fr. Francis Xavier Weninger, S.J. Purgatory Surveyed, By Fr. W. H. Anderdon, S.J. Records of the English Province of the Society of Jesus Historic facts illustrative of the Labours and Sufferings of its Members in the Sixteenth and Seventeenth Centuries, by Fr. Henry Foley, S.J. Saint Ignatius of Loyola: Imitator of Christ By Fr. John Hungerford Pollen, S.J. Saints for Sinner, By Archbishop Alban Goodier, S.J. Sermons of the Abbé Nicolas Tuite de Mac Carthy, S.J. Socialism Exposed And Refuted, by Fr. Victor Cathrein, S.J. Spiritual Exercises According to the Method of Saint Ignatius of Loyola By Fr. Aloysius Bellecio, S.J. St. Justin the Martyr By Fr. Cyril Charlie Martindale, S.J. Surprising Mystics By Fr. Herbert Thurston, S.J. Symbolorum Hieroglyphicorum Et Emblematum BY Fr. Nicholas Caussin, S.J. Synopsis historiae Societatis Jesu : Pro Nostris Tantum by Fr. Franz Xavier Wernz, S.J. Tableaux sacre des figures mystiques du tres-auguste sacrifice et sacrement de l'Eucharistie, By Pere Louis Richeome, S.J. 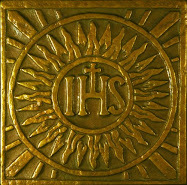 Testament of Ignatius Loyola "Sundry Acts of our Father Ignatius, Under God, the First Founder of the Society of Jesus / Taken Down From the Saint's Own Lips by Luis Gonzales de Camara, S.J." The Art of Knowing Ourselves by Fr. John Peter Pinamonti, S.J. The Art of Worldly Wisdom By Fr. Baltasar Gracián, S.J. The Bible and belief, a letter to a friend by Fr. William Humphrey, S.J. The Complete Poems of St. Robert Southwell, S.J. The Devotion to the Sacred Heart of Jesus By Fr. Hieronymus Noldin, S.J. The First American Sister of Charity, Elizabeth Blayley Seton By John Clement Reville, S.J. The Happiness of Heaven, by Fr. Florentin J. Boudreaux, S.J. The Heart of Revelation - Further Traits Of The Sacred Heart By Francis Patrick Donnelly, S.J. The Heart of the Gospel - Traits of the Sacred Heart By Francis Patrick Donnelly, S.J. The Irish Monthly (1908) By Fr. Matthew Russell, S.J. The Life and Letters of Fr. John Morris, S.J., By Fr. John Hungerford Pollen, S.J. The Life of Fr. John Gerard, S.J. by Fr. John Morris, S.J. The life of Monsignor Robert Hugh Benson, Volume 1, By Fr. Cyril Charlie Martindale, S.J. The Life Of St. Peter Claver, S. J. The Apostle Of The Neghoes. The Names of God: and Meditative Summaries of Divine Perfections By Fr. Leonard Lessius, S.J. The Parables of Père Bonaventure Giraudeau, S.J. The Prisioners of the King, By Fr. Henry James Coleridge ,S.J. The Prisoners of the King, thoughts on the Catholic doctrine of Purgatory By Fr. Henry James Coleridge, S.J. The Son of Siro A Story of Lazarus By Fr. J. E. Copus, S. J. The Spiritual Retreat of St. Claude de la Colombiere, S.J. The Story of Blessed Rudolf Acquaviva and of his four compaions in Martyrdom of the Society of Jesus. by Francis Goldie, S.J. The Story of St. Stanislaus Kostka, S.J. The three sisters of Lord Russell of Killowen: and their convent life By Fr. Matthew Russell, S.J. The Troubles of our Catholic Forefathers, By Fr. John Morris, S.J. The way of interior peace: Dedicated to Our Lady of Peace By Fr. Eduord De Lehen, S.J. The Zi-ka-wei Orphanage By Fr. Dennis John Kavanagh, S.J. Theodore Wibaux, Pontifical Zouave and Jesuit By Fr. Charles Marie Emmanuel Du Cöetlosquet, S.J. Thesaurus Epitaphiorum Veterum Ac Recentium Selectorum By Fr. Philippe Labbé S.J. Three Letters By Fr. Edward Petre, S.J. Tom Playfair By Fr. Francis James Finn, S.J. Tragoediae Diae Sacrae By Fr. Nicolas Caussin, S.J. Twelve Considerations On Death, By Fr. Luigi La Nuza, S.J. Urbs et Orbis or The Pope as Bishop and as Pontiff. by Fr. William Humphrey, S.J. Voyages et Missions du Père Alexandre de Rhodes, S.J. Western Missions and Missionaries: A Series of Letters, By Fr. P. J. De Smet, S.J. Fr. Harry J. Gensler, S.J. Fr. Joseph F. MacDonnell, S.J. Fr. Samir Khalil Samir, S.J. Selected Works and Writings of Fr. James B. Reuter, S.J. The Ultimate Fr. John Hardon, S.J. Saint Claude La Colombiere, S.J. Saint Francis of Girolamo, S.J. Saint John de Brébeuf, S.J. Saint John de Brito, S.J. Saint John de La Lande, S.J. Saint John Soan de Goto, S.J. Saint John Francis Regis, S.J. Saint Roque González de Santa Cruz, S.J. Blessed Diego Luis de San Vitores, S.J. Blessed Ignacio de Azevedo, S.J. St. Claude de la Colombière, S.J. Anglican's Spinning Out Of Control! Fr. Jose Luis Aleman, S.J. "Rest In Peace"
How About This For A Retreat Center? When Will Weston Start Its Courses? They Call It DeMello Yellooo... That's Right! Death To Sin, St. Alphonsus Rodriguez, S.J. I am not a Jesuit, nor am I a cleric. I spent about 5 years under the spiritual direction of a Jesuit, 3 of those years in a weekly directed retreat in everyday life. The profound impact that the Society and the Excercises had upon my life, resulted in me, trying to deal with that impact in some way by sharing my view of Jesus Christ with others. My intention is to pull together Jesuitical and Catholic subjects that interest me. I was born on the feast day of St. Paul Miki, S.J.. I am the father of three small children and an infant, I am married to a great wife.